You still want different looks and a range of images, but you want it right now. You want to get in, shoot, get out and have that stellar retouched image in your inbox in less than 24 hours. You got it! With the standard headshot you come to the studio ready for the camera, bring some options for looks and wardrobe, we work with you to bring out your best expression, photograph you, and you see the results on a computer screen right then. You have a gallery sent to you, and as soon as you pick your favorite, with the ASAP package in most cases have that retouched and emailed to you that same day. If the session runs too late in the day, we might have the gallery sent to you by next day, but no more than 24 hours. 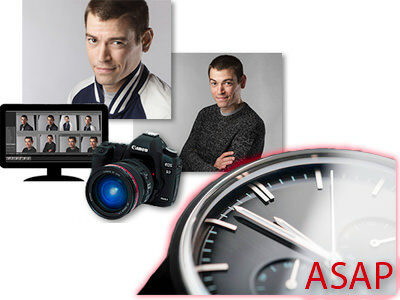 As with any headshot session, feel free to call and ask any questions in advance. We want you to have a good time and be yourself, and it will show on your pictures!